At the recent Los Floridanos meeting in St. Augustine, someone was asking about how some family member got such large tracks of land. There are several ways these pieces of land were obtained in Florida. Are the most common methods in Florida. 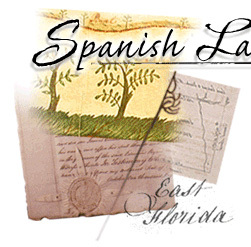 Most of the files on the Spanish Land Grants are available through the Florida State Archives. The physical copies remain in Tallahassee, but the State provides images of these files online at: Florida Memory – Spanish Land Grants, www.floridamemory.com/collections/spanishlandgrants/. Prior to the sale of Florida to the U.S. government, the King of Spain gave land grants to many individuals. After Florida became part of the U.S.A., the U.S. Supreme Court had to decide whether the land grants were valid which created a good paper-trail. The original land grants were in Spanish, but for the court were translated. That is why you will find both languages in the documents. Only some of the West Florida (the Panhandle) land grants are missing. At the website you will find images of each folder and it's contents that you can print or save as a digital color jpg-file (if you right-click your mouse when the cursor is over the image, you will find a selection of features.) Since the legal proceedings were lengthy, the title of the land grant may have been passed to heirs or sold for cash. An online tool for finding the other types of land acquisition from the U.S. government is the Bureau of Land Management’s Government Land Office Records, www.glorecords.blm.gov . Look over the information page, but click the words Search Documents next to the house symbol on the green bar down from the top. You should be on the Search Page with the defaults of “Search by Document Type” and “Patents” selected. You will need to select Florida for a location for your initial search leave the county unselected. Next in the names area type the last or surname (if more than one spelling is possible you will need to repeat the search for each), for the initial search don’t enter first or middle names. The click Search Patents on the orange-brown line near the bottom of the page. To see a record, click the leading image or accession number. If you need to shorten your list, add first names or a current county. It is an informative database for you to find land records and some history. DO NOT BUY CERTIFIED COPIES, you can print and download images for free. The State of Florida maintains a similar looking website that you may find useful called the Land Document Search, 199.73.242.56 . It is free. In the 1840s the U.S. government passed the Armed Occupation Act of 1842. A Florida resident could claim 160 acres of land by settling on land South of Newnansville and Palatka and also away from other regular settlements and outposts, register with the General Land Office (GLO), farm 5 at least of the acres, built a house. This put the settler on the Indian Frontier and he needed to be prepared for conflict. Military Land Bounties were granted to the soldiers after wars. The size of the bounty was sometimes determined by the soldier’s rank. And sometimes the bounty could be transferred to an heir. In Florida the veteran could apply for a military warrant that could be applied to acquiring a government owned land. The veteran had the option of selling the warrant. Typical military warrants in Florida were for the Seminole Wars and Mexican War. This posting is already too long. I will write another discussing Townships, Ranges, and Section soon. Please comment, if I explained poorly or got it wrong. Or if you have more tips for us. The software omits anonymous comments so leave us your link. Tom, could you give us an idea of how the geography of Spanish Florida compared to where our shared ancestors might have lived? You know, maybe a map today and what towns are there today? My mother once said Francisco X's lands extended as far west as O'Leno State Park, but I know you have physically walked some of these areas. What do you say? I have found Francisco X's land holdings hard to follow, Francis X's are a little easier. But this is more than a comment, I will email you.